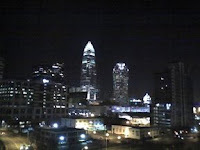 On Mondays, I stay in Charlotte overnight. It's making a huge difference by cutting my drive in half. Here is a view outside my room on the eleventh floor of the Hampton Inn. I am able to get a lot more accomplished since I am not coming home Tuesday nights totally exhausted.